Although I didn’t like the Etude House Color Lips Fit too much I didn’t give up matte and moussy lip products. I decided to give a try to Skinfood Milky Rose Vita Color Lip Lacquer, which was released together with some of my favourites. the Skinfood Rose Essence Blusher and the Rose Shake Point Makeup Remover. 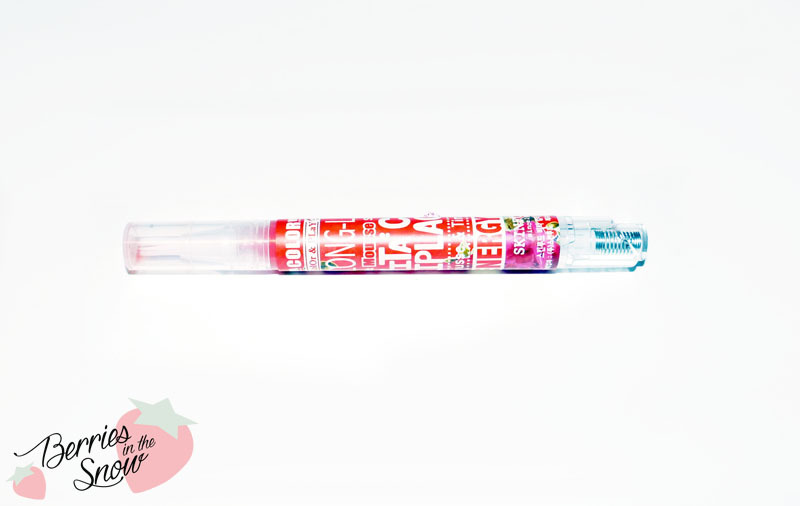 This product is a mousse type liptint and lipstick in one and it comes in the shape of a pen. Skinfood is one of these brands which are competing with Etude House in terms of design– in my opinion at least. It is a Korean brand with vintage appearing design of their products which occupied my heart very quickly. The products are using the beneficial effects of ingredients, which are familiar to us in terms of “food” like vegetables and fruits. Their motto “Food that is good for your health, is also good for your skin.” reflects this brands’ ideology nicely. Their spring make-up collection of 2014 was called “Milky Rose”and the design of the products offered within this collection is beautifully selected,showing vintage-style rose drawings and pastell pink packaging. The design is really beautifully chosen and fits perfect for a spring collection. Apart from the Skinfood Milky Rose Vita Color Lip Lacquer nailpolish, blusher, make-up remover and a make-up fixer were offered. As I said, this lip lacquer comes in a pencil shaped packaging. 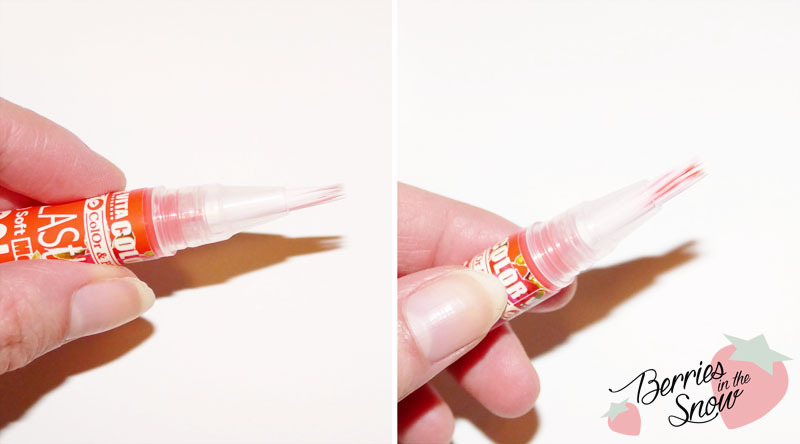 It has a brush tip similar to the Missha The StyleTinted Jelly Lips where the product comes out when pressing the bottom side of the pencil. The material of the pencil is made of plastic, but it doesn’t feel easily breakable. I chose shade CR02 “Milky Coral” out of the 9 available shades. At the bottom you’ll find the button to press in order to make the product come out of the brush tip. The instruction says to push it 2 times. Depending on how much product you want you can also click less or more. When swatched the product comes out as a shiny,creamy tint. It tends to feather around the edges into the fine line of the skin. After a while it dries of matte. 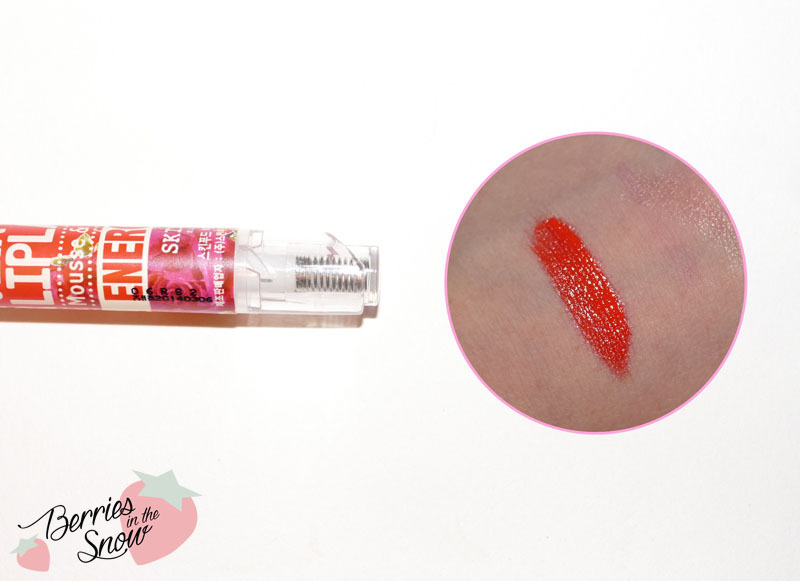 While applying the mousse feels very soft and velvety, similar to the Etude House Color Lips-Fit. It is not drying but moussy in the texture. It has a light scent of ginger/citrus to it. The color looks like a mixture of orange and red, whith a peach undertone. Not exactly as the color I expected from the swatch, but this maybe due to my skincolor and lipcolor. Since the color is bright it will be visible in your lip lines more, if you have darker pigmented lips. If you have dry lips you should definitively exfoliate before using this lip product (and also with other matte or semi-matte lipsticks). 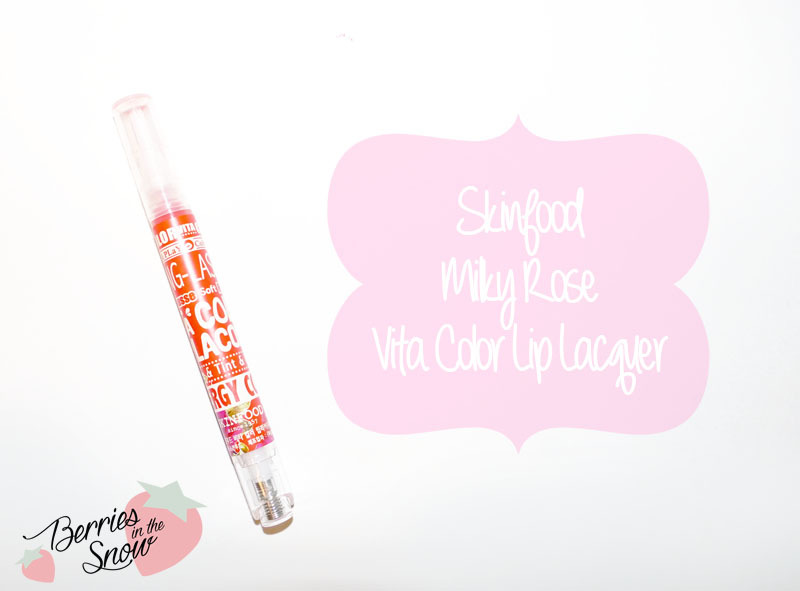 Unfortunately, the Skinfood Milky Rose Vita Color Lip Lacquer is not transfer or rub proof. It smears easily and is not longlasting either. 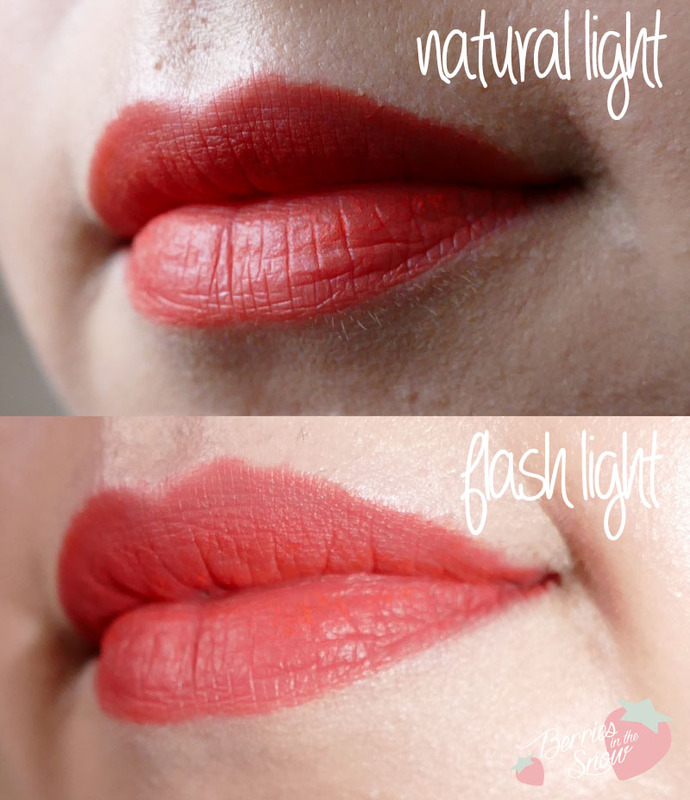 Do I prefer this over the Etude house Color Lips-Fit? Yes, I do! It feels nicer on the lips and feels less drying. Also the brush tip makes the application very easy. I prefer to only use it as gradient lips using a small amount of the product. Nevertheless, I would not claim this as my new favourite lip product. I’m still on the hunt for a good mousee/matte lip product. Maybe I would have liked this in a darker red shade more, than in this light shade, because of the color accumulating in the fine lines of my lips….who knows?! If you want to give it a try it retails for 5400 Won (~6 US$) on testerkorea. Great review! This lip lacquer’s color and pigmentation are impressive! Claudia last post…U-KISS FINALLY WON 1ST ON A MUSIC SHOW! hello dear,just want to inform you that i just tagged you to receive Versatile Blogger Award because i think you’re an amazing blogger and deserve this! would love to read about your post soon! Oh, I thought this would be more gentle with skin. Well, it’s the problem with matte lip product. Despite that, I’m so curious about The Saem eco soul kiss button lips, have you seen that? There are a few collections and also matte tones ^^, I’ve seen it in Beautynetkorea. That will be my next purchase. It is not harsh really, It is just that it accentuates all the lines and flakes because it is a bright color. The product itself is very gentle and smooth. I will check out the Saem lip products now, I never actually bought anything from that brand so far. I´m impressed the pigmentation is very intense.